1. Do not paint when the air temperature falls below 4 degrees Celsius, or when frost is present. For most paints on the market which are conceived for an exterior usage, the paint starts to freeze and to crack just below 4 degrees Celsius. Be sure that your paint will have the chance to completely dry before the temperature goes below 4 degrees. It’s important to carefully read the label on your paint can. Some products do not adapt well to climate change. 2. Do not paint directly under the sun. Do not paint during a heat wave, or when air temperature exceeds 30 degrees Celsius (maximum safe temperature depends on the kind of paint). Painting an aluminum roof, for instance, directly under the summer sun rays brings some unfortunate consequences. The paint might do bubbles and peel, or crack in the following days. Thus, try to paint in the shadow, or start painting late at night so the pain twill have time to dry before the sunrise. To learn more about how to prevent your paint from making bubbles and peeling, see our post How to prevent paint peeling and bubbling. In fact, the exterior maximal air temperature at which we can apply paint without risking having to do it all over again depends on the kind of product used. Most water-based paints can be applied at until approximately 30 degrees Celsius, but the surface, if directly under the sun, is way hotter than the air, and that’s why we work against the sun when possible. As for stain, when applied on wood or masonry, for example, the surface needs to be under the shadows and not warm nor cold to the touch. 3. Do not paint during a precipitation (rainfall or hail). 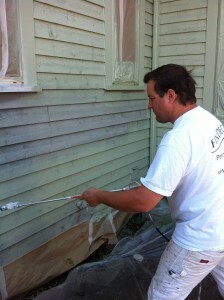 There is a simple rule: the more moisture there is in the ambient air, the longer it will take the paint to dry. Thus, even when the rain does not fall directly on your surface to be painted, it is important to make sure that no one touches the fresh paint for some hours more. Please be aware that the drying time indicated on the label does not take into account the air moisture factor. Hail obviously can damage your paint finishing touches. Proceeding to the touch up would be so laborious that it’s better to simply add another paint coat. 4. Be aware of the temperature of the surface when painting metal. Metal holds its temperature longer than any other kind of surface. The problem is often that it’s too cold, like during spring and fall, and it will take a lot longer to dry, plus it will reduce greatly the adherence of the masking tape. And during a heat wave, obviously, the paint cracks or makes bubbles.